Insert correct Gate_Pass & Captcha to access active area. At UpMarch, Our customers enjoy quality reading. Then as media associates, build business all across India both online & offline and network even in "Real Business Mode". Then divert to set-up own PR/AD Agency or Route Distribution business to grow further. For those in business, UpMarch is a WIN-WIN tie up to market existing businesses even In Effect "Multi Level". Businesses also use UpMarch coupons as an 'allocation leverage' to stretch the ad budget and gain maximum mileage by also opting for lower cost options on the same media it has been using all along... 'discretely'. Discrete advertising is a way to use cheaper ad formats like inserts & classifieds indirectly to promote a higher value brand without diluting the brand value! For all, its a multidimensional opportunity. For businesses, its has easy ad solutions. You are already in the site! that's why you are seeing this page, but the game starts with-in the activearea [Shopping area]. To enter the active shopping area, please SUBMIT the Entry_Gate_Pass you already have along with captcha image code. If you do not have a gate_pass, browse the local newspapers for one. Many associates who promote this opportunity in "Real Business Mode", resort to newspaper classifieds. These small ads are very effective as well as cost effective. You will find more instructions there. How to order in activearea? Once you are with-in the shop area [activearea], its easy to find 'Categories'. Simply follow the links, take your time, read the tips included... that's it. With-in the process of placing the order, the system will collect your details through a "Customer registration" form. Your email is your USERNAME and you will also enter a PASSWORD for future logins. Simply follow marked links to place order. Default order status is 'Pending', once payment is cleared, this will change to 'Updated'. Note down your customer username and password on to somewhere safe. Customer and associate registrations are seperate. Payments can be made securely trough the available options [more details in payment page]. Books offered at the activearea? This is not a complete list anyway! Generally, buying an ebook is much cheaper than buying a paper back or hard bound. By saving the ebook on any digital media, it will be available for many many years to enjoy. Once the order is fully processed, again use your Entry_Gate_Pass to access UpMarch shop area, login using your email [Username] & Password... Follow 'My Account' link... you will find books ordered 'Available For Download'. Download the books you ordered & ENJOY! Actually UpMarch 'offer' is not limited to books.. its a full fledged business opportunity. Customers who has at least orders worth Rs.500 [Base Order] to their credit at the time of associate sign up may opt to affiliate with UpMarch.com as a media associate. Media associate enjoy direct returns from multiple levels from direct shopping cart sales and earn even more using plugins like encash coupons . UpMarch.com offers a state of the art platform for the media associates to operate and profit from. The Gate_Pass system allow media associates to rapidly develop nation wide even without 1-ON-1 public relations. As UpMarch is a web enabled business, any net-cafe is a retail point, any net enabled laptop or netbook is a traveling office! Being a media associate is your passport to operate a coupon centered ad-agency or route-distribution or a DSA organisation. All these businesses support and allow passive networking on the background. You the customer again come to UpMarch... Enter shop using old Gate_Pass.. Follow media associate Login link... In associate registration form...Space available to create a NEW Gate_Pass. Register as a media associate. CONGRATS! Pass you got from Public media is your 'Gate_Pass' or lets say.. Entry_Gate_Pass. The pass you create is your Public_Gate_Pass or your downline's Gate_Pass. Promote 'your' Public_Gate_pass. Build your online business empire. Promote coupon, the ad platform to build an offline business... Its this simple! Any Indian national who is legally mature/major, with a sound mind, who is residing in India [Commission cheques only delivered to an Indian address], who is an UpMarch.com customer with atleast Rs.500 worth of purchase to their credit with-in a period of past 1 year of registration submission is eligible. Recommended: Make purchase[Rs.500 +] in a single order, to get 1 full year. After 1 year, media associate's "ACTIVE" Public_Gate_Pass will be evaluated as "PASSIVE" unless associate update it with another purchase more than Rs.500, the 'Base Order'. Let's take this example: Customer A made a purchase of Rs.550 'this month', courier a DD immediately, order get processed and became eligible to register as media associate, does that in a day . 'A' got 1 full year "Active" life. Customer B purchase for Rs.300 this month, 300 after 4 months [that's 4 inactive months lost, since its lesser than base order]. Here customer B's pass become "Passive" after 8 months of his 2nd purchase, after that, there is only Rs.300 to his credit. 'B' gets only 8 months of "Active" life. 'B' then top-up & continue. A media associate gets credit and commission as long as their Public_Gate_Pass is "Active". When an associate's downline [new prospect] uses a "Passive" pass, they will be allowed through for 1 more year but, the media associate who issues that pass, won't get credit for bringing that visitor in. UpMarch.com do not collect any membership fee. Any customer who is eligible can opt to join as a media associate. Since the system offers much more than any normal MLM or affiliate platform would do and support, UpMarch.com collects a facilitation charge from those media associates who have earned & use-up huge database recourses. A facilitation charge of [Max] Rs.3000 is collected from those who have earned at least five times of the facilitation charge. So this charge is collected [As deduction from coming year's pay check] only from those media associates who have earned more than Rs.15000. Its a min:1 year credit UpMarch extend to associates. YES! we have such faith in this system, its capability, diversity, usability and YOU. Don't have to direct market? UpMarch.com has a very flexible 'activearea' system and could be promoted in many different ways. So, its easy to accommodate different personality traits. Those who are reluctant in a one2one type marketing, don't have to! But its funny to know, we do 'direct marketing' in our daily life. When we purchase something, its what we are indulging in! We part with some 'value' [Money!] to acquire another 'value' [say grocery]. Actually we are very confident about the value of the 'value' we part with, we are confident, the deal will be through..
View things 'this way round', if you know the value of the product and/or opportunity you present, you will feel that same confidence. Do read Tutorial_Detailed and PARTICIPATE. Key factor a media associate should know about UpMarch.com network marketing strategy is optimizations for easy 'people participation'. With the Gate_Pass system in place, people can participate 'sequentially' even without 1-on-1 interaction and enjoy 'Multi Level Associate Benefits'. Two components are must in all your public relation efforts. Of course... friends and relatives. Integrated multiple ad systems enhances the possibilities. UpMarch is also a business support platform. A viable point to present and build more solid businesses in parallel. Can I operate nation wide? Generally network marketing businesses develops on a 'one-ON-one' basis, attending seminars, meeting targeted prospects, its lot of effort, fruitful but, its mostly local. A media associate may duplicate same strategies to promote UpMarch business too.. but, at UpMarch, associate is not restricted to these alone. Here, associate may indulge in 'Real_Business_Mode' and grow exponentially and fast. Since UpMarch is Gate_Pass enabled, there is no geographical boundary limitations to spread. A National boundary is insisted because UpMarch accepts only Indian Rupees as currency. 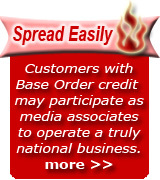 Create a network and business that spread across the nation... In thousands of big and small towns of our great nation INDIA. What's UpMarch profit share plan? UpMarch allocate 50% of 'activearea' sales to be distributed as network commission! out of which 20% for direct involvement and balance echo from lower levels. A versatile report engine is attached for associates to asses the account position and to track sales from own effort and of those associates positioned up to four levels deep with percentages and calculated returns clearly marked. UpMarch do not follow a binary plan, pair locked binary is more beneficial for the company that use it than associates. UpMarch has not fixed an income ceiling. UpMarch associate can build a super wide network. Supports even basic networking in "Real Business Mode". UpMarch help parallel businesses that boost network & facilitate multi-channel income. Its easy to differentiate a pyramid network, Pyramids will have a 'big' membership fee and its collected upfront. Pyramid promoter benefit is a share of this membership fee. Pyramids generally won't have any product to sell, if there is, usually its like holiday for 2 at Timbuktu! company pay hotel fare and customer pay air fare so nobody actually purchase it! In money/cash-chain, in addition.. won't even have a centralized processing, here members send money to each other directly.. as gift! At UpMarch, Associate's on-site income is based on site-sales generated, that's normal agency/affiliate business. Additional income like from coupon based ad-agency or from distributing coupons are also returns from normal business operations. What's work in "Real Business Mode"? Unlike any multi level marketing system in operation today, UpMarch do not insist on a friends and relatives circle marketing. This mode some times result in strained relations. UpMarch, its flexible, here both personal and impersonal marketing co-exist, compliment. A housewife who has to be at home, promote UpMarch without leaving her place! An insurance advisor prefer 'personal' route. A hording owner fill up vacant timeslot with UpMarch ad, with his Gate_Pass displayed loud! For active associates, an FMCG mode can be replicated using EnCash coupons and tap other working marketing agents or even local department stores! To expand fast, professional marketers may also introduce UpMarch Ad systems to local business community. UpMarch is truly a multifaceted business opportunity. Here even baasic networking is marketable like a "REAL BUSINESS". 1] Separate registrations. Customer may buy without committing for MLM participation. 2] A full self service registration system, no outside intervention needed, secure. 3] Use your own username and passwords. 4] Gate_Pass system to track users. Associates won't lose commission. 6] Flexible. Accommodate innovative marketing initiatives of Media_Associates. 8] Commission is calculated automatically without human intervention. UpMarch is a Deanlurell enterprise. Your team is glad to extend any help, anytime. Mail at for more. Deanlurell, T D Road, Cochin 682011, India.